This is a fantastic mini RC drone with a unique design and stunning appearance. The sci-fi aesthetic fuselage design with strong propellers feature an outstanding efficiency and high flight performance. 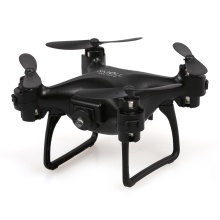 The 6-axis gyro and altitude hold function provide great stability, it&apos;s a perfect mini drone for both indoor and outdoor. Function: Up/down, forward/backward, turn left/right, left/right side flight, one key start/landing, headless mode, 3D flip, LED, three speed switch, altitude hold. 2.4G remote control with altitude hold function offer a super stable flight. One-key start/landing functions provide easy operation even for kids and beginners. 3D flip and three speed switch operations add more fun to your flight.